PMO Managers working in industry today have a varied role to carry out. There are many different factors that determine what kind of PMO Manager is needed – the type of business; the number of programmes and projects; the complexity of those and the maturity of the business as a whole. Then there are the differences between the PMO Manager who creates and sets up PMOs – and those that look for longer term commitments to managing those PMOs. Sometimes it’s the same PMO Manager who sets them up and manages them. Sometimes not. The type of PMO in place also determines the kind of PMO Manager required and then there are the functions and services offered by the PMO which again, determines the skill and capability level of the PMO Manager in place. There’s no doubt about it, the role of the PMO Manager can be a varied job, with many different skills being used on a daily basis, working with a diverse range of people across the business. If you’re reading this, I’m assuming you’re also a PMO Manager, or looking to become one. I’m also assuming that you’re interested in this article because you’re looking to become better at the job you do and acquire further skills in this field. The Association for International PMOs (AIPMO) is the certification for PMO Managers who are looking to continue their development following the P3O Practitioner or looking for something which is PMO specific following development in project and programme management certifications such as PRINCE2 and MSP. The AIPMO certifications have three levels, and it is the Practitioner level which is for the PMO Manager. 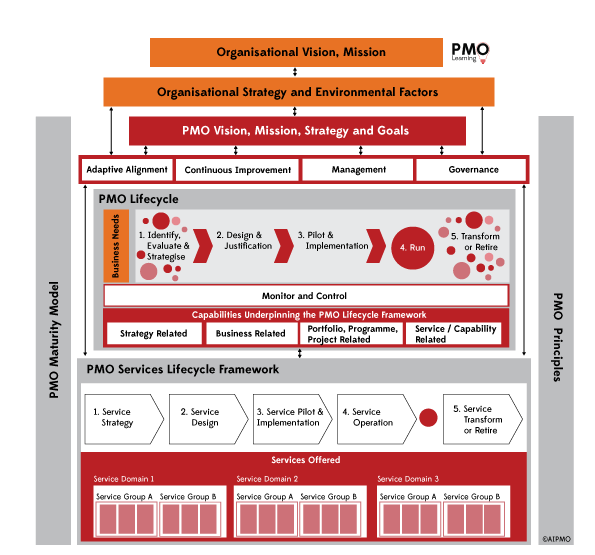 The Practitioner level focuses on the single PMO – project, programme or portfolio office. Enterprise level PMOs are covered at the Expert level of the course. The AIPMO Lifecycle Framework (pictured below) forms the basis of the certification course and is a unique focus for a PMO certification course in that it covers the whole ecosystem in which the PMO sits. It’s a comprehensive course and one which we knew we had to bring to the UK for PMO practitioners. because it really does get into the details of how to set and run a PMO for success.